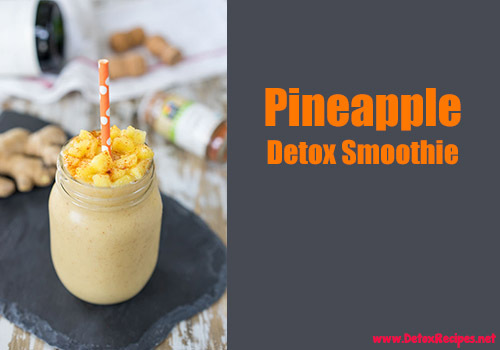 Don’t just take my word for it; Try making this pineapple detox smoothie for yourself to see just how good it really tastes! The combination of sweet pineapple with spicy ginger and cayenne pepper is absolutely amazing and the perfect way to reset your body after a weekend of drinking or partying. The ingredients within this detox smoothie are guaranteed to help flush away toxins and restore the natural balance of your body. Lemons will lower your body’s pH after consuming too much acidic food or beverages. Pineapples are high in the enzyme known as bromelain which will aid with digestion and reduce inflammation. Ginger spikes your metabolism, flushes out waste, aids liver function, and improves digestion. To go along with all of that, there are a few other goodies included with this recipe as well. 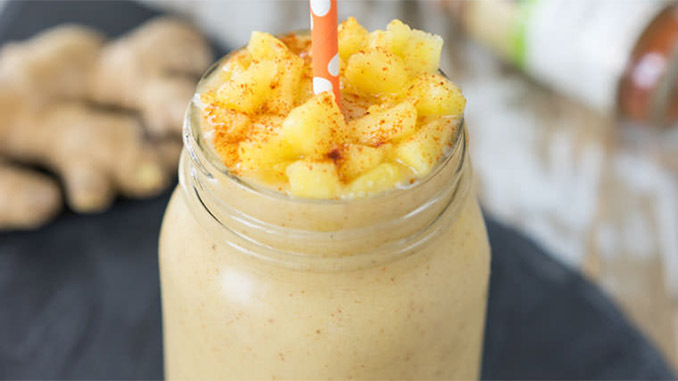 Gather the ingredients below to make this pineapple detox smoothie now! Note: Put aside 2 tablespoons of pineapple, diced, for a garnish. 1. Start with frozen banana and frozen pineapple chunks. You can use fresh banana or pineapple, but the texture won’t be quite as creamy as if frozen. 2. Place all the ingredients into your blender. Start with 1 cup of water and add a little more if the smoothie is too thick. 3. Pour the smoothie into a tall drinking glass and top it with the diced pineapple plus a few pinches of cayenne pepper. The recipe above will make 1 giant smoothie. Feel free to make extras and keep them stored in your refrigerator for future enjoyment. Drink one or two glasses of this smoothie each day and you should feel the cleansing effects from it almost immediately. The optional flaxseeds add extra fiber and omega-3’s. The optional maca powder will replenish adrenals after a stressful weekend.